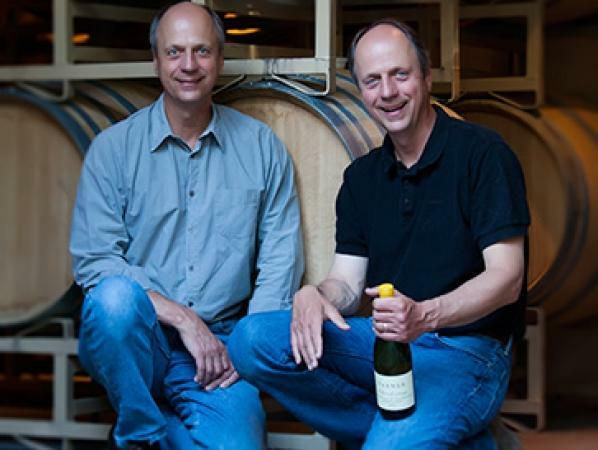 "In 1980, twin brothers Jim and Bob Varner began their labor of love when they planted Spring Ridge Vineyards in Portola Valley in the northern part of the Santa Cruz Mountain Appellation. Located 10 miles from the ocean, Spring Ridge is made up of several separate blocks of vines, each with its own microclimate and soil difference. The vineyard has been dry farmed and hand-hoed since 1988. Insecticides have never been used, nor fertilizers. The grapes are hand-harvested only in the morning into small lug boxes to allow natural cooling of the juice. Bob works in the rows during each harvest, insuring that sorting is done at the vine rather than at the winery. The wine is treated as naturally as possible, using indigenous yeast and malolactic bacteria from the vineyard. Rather than fining and filtering, the barrels are hand-racked, using a fontaine d'aspiration and a hand-cranked barrel lifting device. With this method, the lees are not disturbed and the wine is clarified without filtration."